Rabbi of Cracow; died Aug. 16, 1599. At first chief of the yeshibah of Szezebrscyn, government of Lublin, Poland, he was later called to the rabbinate of Vladimir, Volhynia. There he was one of the rabbis who signed the protest against the shameful selling of the rabbinate, a protest afterward renewed by Yom-Ṭob Lipmann Heller. From Vladimir he was invited to the rabbinate of Cracow, where he died. He was the first "ab bet din" or chief rabbi of Cracow; previously the affairs of the community had been decided by three dayyanim. 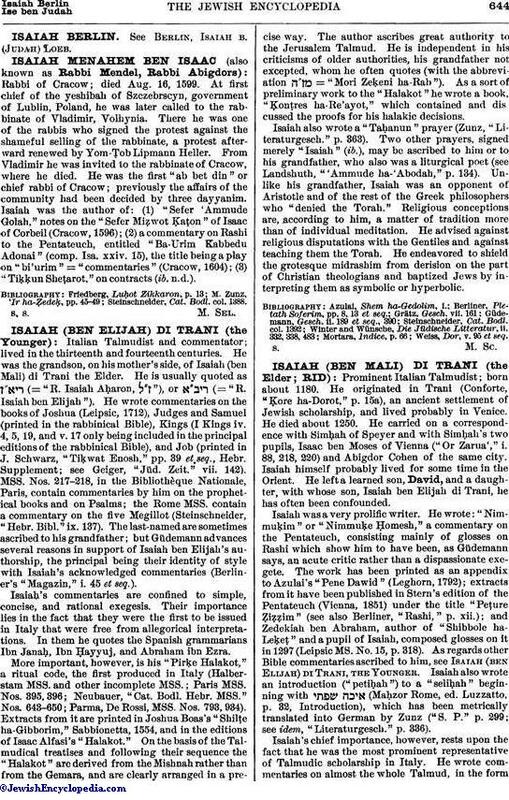 Isaiah was the author of: (1) "Sefer 'Ammude Golah," notes on the "Sefer Miẓwot Ḳaṭon" of Isaac of Corbeil (Cracow, 1596); (2) a commentary on Rashi to the Pentateuch, entitled "Ba-Urim Kabbedu Adonai" (comp. Isa. xxiv. 15), the title being a play on "bi'urim," = "commentaries" (Cracow, 1604); (3) "Tiḳḳun Sheṭarot," on contracts (ib. n.d.). Steinschneider, Cat. Bodl. col. 1388.